Shelves are a great way not only to display but to organize and decorate as well. 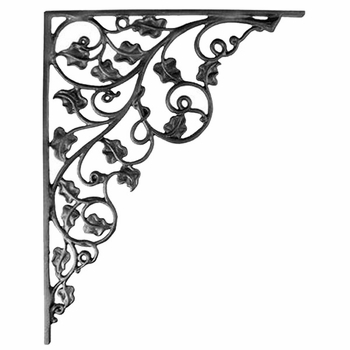 Easily attached to your wall a shelf adds a functional element to any room, and our decorative iron shelf brackets are perfect for supporting all the shelves you could need. 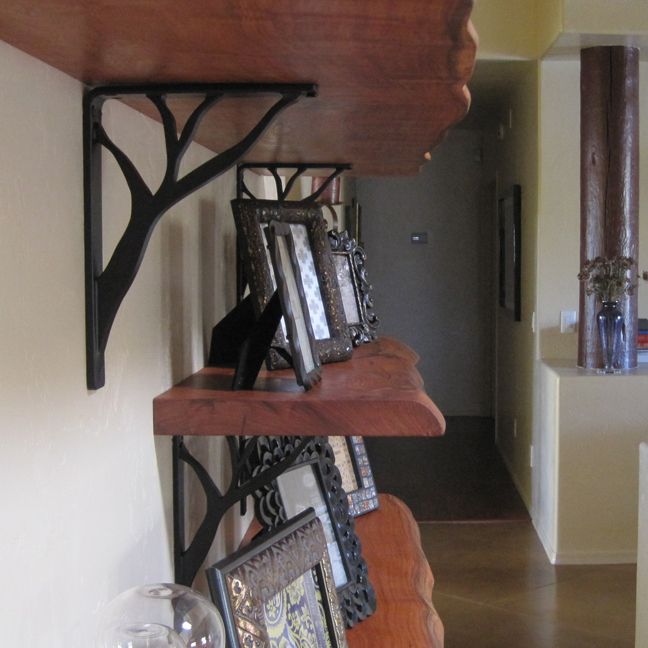 Iron Bracket supported shelves can be used throughout your home. 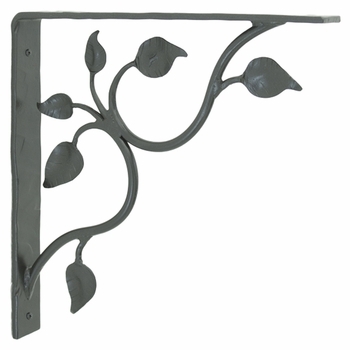 Whether placed below a piece of metal wall art to fashion a creative wall display, mounted on a fence behind your outdoor patio furniture and lined with plants or staggered along a wall to display books and artwork, our metal shelf brackets come in a variety sizes and styles that will add a tasteful yet functional accent to your project. 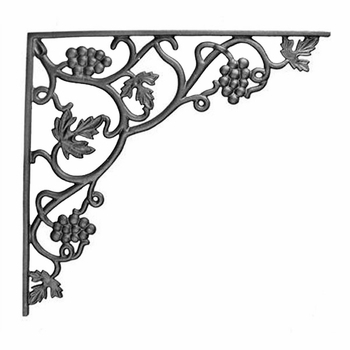 Not only one of the most popular items we carry, shelf brackets are also the most versatile. With sizes ranging from 5" to 24" brackets can be used for everything from supporting shelves and counters to framing windows and doorways. 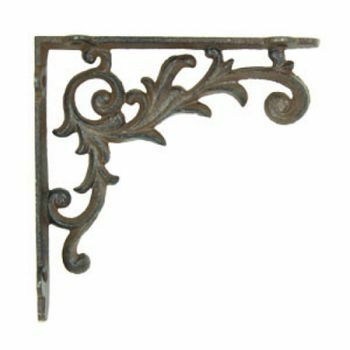 Our line of decorative shelf brackets, available in a include a wide assortment of designs and a variety of designer colors, With so much to choose from our stunning designs are sure to spark your creativity. Shelf brackets make eye-catching, inexpensive home accents that provide a striking alternative to more traditional shelving. 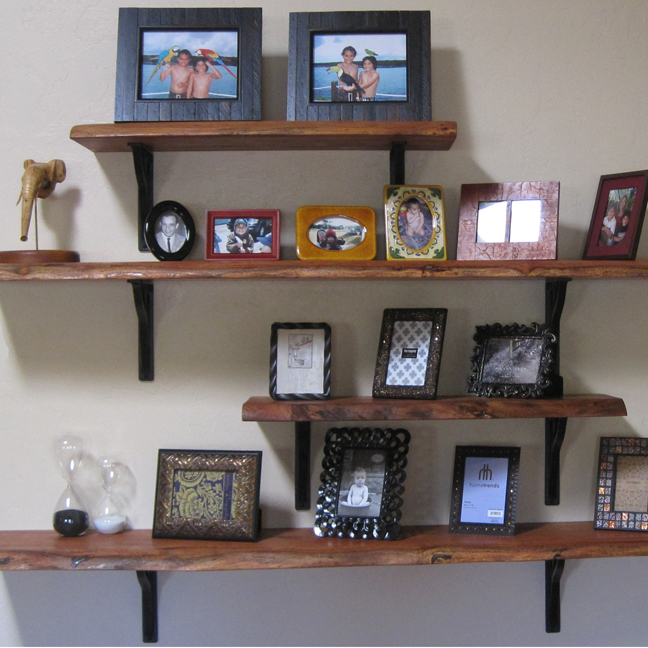 Bracket supported shelves can be used throughout your home. 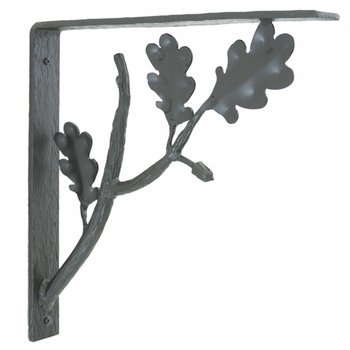 Whether placed above a kitchen or living room window and lined with plants or staggered along a wall to display books and artwork, our shelf brackets come in a variety sizes and styles that will add a tasteful yet functional accent to your project. Use shelf brackets to create a wall-mounted bookshelf. Hang five or six shelves of the same length on the wall approximately 10 to 12 inches apart. Arrange books, vases and picture frames on the shelves for a creative display. Hang a large shelf @ 14" or deeper above your fireplace as a makeshift mantle. This makes a great place to display picture frames and other personal items and is perfect for the holidays, to decorate with holiday stockings and garlands. Decorate in unexpected places. 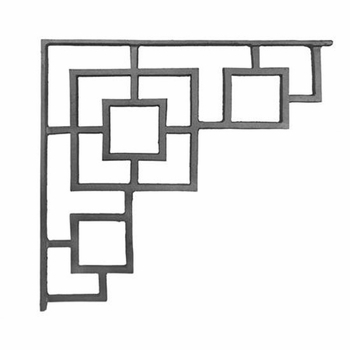 Use shelf brackets to hang a wall shelf above your doors or windows to display collectables or holiday decor. 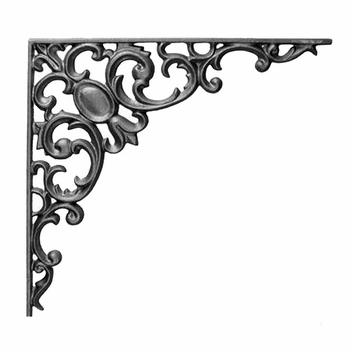 Sturdy cast iron brackets: Unlike wrought iron, cast iron is too hard and brittle to be shaped by hammering, rolling, or pressing. However, because it is more rigid and more resistant to buckling than other forms of iron, it can withstand great compression loads. 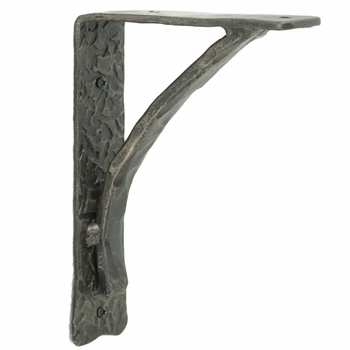 Cast iron shelf brackets offer wonderfully detailed designs and the benefit of mass production. Once the mold is made many copies can be produced for reasonable cost. 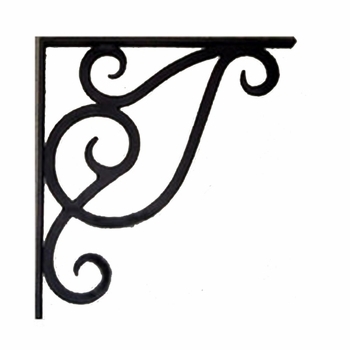 Unique forged iron brackets: The term forged means hammered and shaped on an anvil when hot, usually prior to being wrought or added to a wrought design. 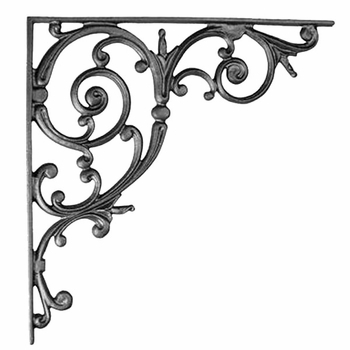 Wrought iron shelf brackets are made by heating and bending or forming the rods of wrought iron. 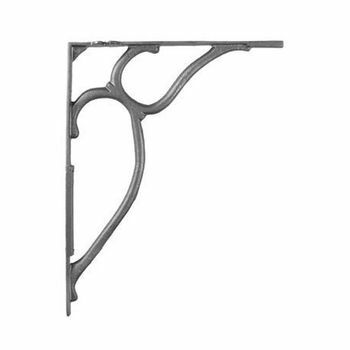 Beautifully detailed aluminum brackets: Our line of decorative aluminum shelf brackets offer the beauty of iron without the weight. Perfect for use indoors or out they have the added advantage of being rust free. 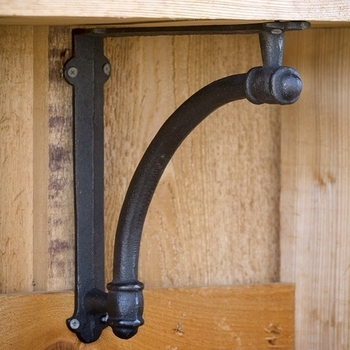 Always anchor weight-bearing brackets directly into a wall stud. The easiest way to find your wall studs is to use a stud-finder. If you don't have a stud-finder, study the baseboard for nails. The studs should be right behind them. Another hint: studs are generally placed 16 inches apart. Lightly tapping on the wall with a hammer or your knuckles should produce a distinctly more "solid" sound over the stud. As a rule of thumb, you should use support brackets every 24 inches. For very light loads, you can get away with 36 inches between supports. Be sure to consider the weight load the shelf will bear, the weight of common everyday objects can be greater than you realize.